Browser Hijack Recover(BHR) is a safe and easy-to-use tool that recovers your browser after it has been hijacked by Spyware, Adware, Hijackware and Other Pests. 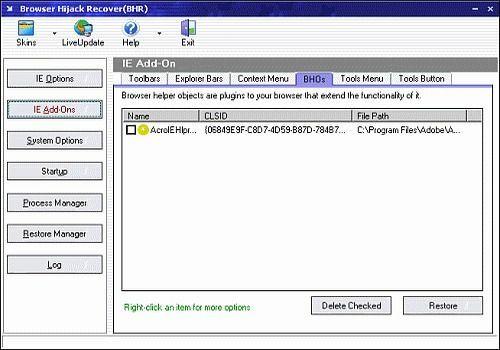 Browser Hijack Recover(BHR) wills scan your registry and fix IE Homepage, IE Default Page, IE Search Page, BHOs, IE Menu, Internet Options, IE Search Hooks, IE Toolbars, IE Context Menu, Registry and so on. It resumes your broswer to the state that was just installed. Hundreds of known browser hijacker defines help you find out who had changed your browser. Browser Hijack Recover(BHR) is designed for computer users, not experts.